There are a wide variety of accidents that can take place while boating. Due to the vast amount of possible incidents, there is a different set of rules and regulations that govern the waterways. Maritime law is a distinct body of law that governs maritime questions and offenses. It is a body of both domestic law governing maritime activities, and private international law governing the relationships between private entities that operate vessels on the oceans. Video by passenger Woody Gordon shows ferry riders watching as the 13 foot wave crashed on deck resulting in injury and damages. If you are a victim of a boating accident, Slaughter Law recommends taking the following steps to help insure you get the justice you deserve. Notify the authorities. If you are offshore, you are out of the state’s jurisdictional territory and you will need to notify the Coast Guard on your VHF radio. Channel 16 is the emergency channel that is monitored at all times. If you are inshore, call or radio the Coast Guard, the Sheriff’s Department, or the North Carolina Wildlife Resources Commission. Calls to the Coast Guard are recorded and can be recovered later if needed to help your case. Receive Medical Care. 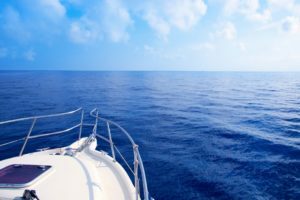 Generally, injuries from boating accidents are parallel and just as serious as those that happen on shore. If you are badly injured, go and receive medical care. If you suffer from minor injuries, still see a medical professional after the incident. If you have seemingly no injuries, Slaughter Law recommends you still see a medical professional to rule out any unknown injuries that could become a problem after the case is settled. Make sure to take pictures of all injuries and keep medical bills and records. Mark your location on your GPS. Boats will move with the tide and the current. Marking your latitude, longitude, and time of the accident as soon as it occurs will help establish liability as well as which set of laws, federal or local, may apply. Take Pictures and Videos. Take as many as possible from all angles. Movement on the water is very likely, having these sources on hand will help with any possible disputes. File a report. According to N.C. Wildlife Resources Commission, you are required to file a report as soon as possible. A report must be filed if there was a loss of life, an injury requiring medical treatment, a person left unconscious or disabled for 24 hours, physical damage to property over $2,000, or if a person disappears from the vessel under circumstances that indicate death or injury. Notify Insurance. Make sure to notify your boater’s insurance of the incident. To learn more about boating laws and requirements and safety on the water, review N.C. Wildlife Resources Commission’s Vessel’s Operator’s Guide. For a comprehensive guide of safety elements you should have aboard, review the N.C. Boating Checklist. For a free consultation, contact Slaughter Law at 910-763-1109.